Red No. 3: Fat Hate Bingo! Red No. 3 presents FAT HATE BINGO! The cool new game that's sweeping the nation. Inspired by Kate Harding's post at Shakesville and 1,000,000 earlier posts that unfolded the same exact way. No longer do you have to be bored to tears by the same old arguments offered by anti-fat crusaders whenever you want to discuss fat acceptance. With FAT HATE BINGO you can make a game of the repetitive talking points that get trotted out in every single conversation about fat. Five clichés in a row and you've got FAT HATE BINGO! Click on the image below and print out your FAT HATE BINGO card today! And feel free to offer your own clichés for the inevitable FAT HATE BINGO 2. UPDATE! There was just too much for one card. Check out FAT HATE BINGO 2 for more. 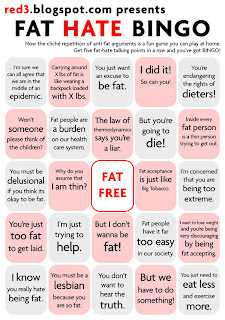 I'm writing a post fisking a fatphobic comment I got today that probably gets bingo all by itself, and was pointed to these so I wouldn't have to reinvent the fat-hate-bingo wheel. But I'm looking and I don't see any use guidelines anywhere. So may I use these in my post (with links, of course)? Oh, absolutely. I have no issue with other people using this as long as it links back here. I've seen some bingo's in my day, too. The diagonals here are pretty easy to make, actually. And gosh knows there is enough fodder out there for a few more of these.